Parker's Barkers: Why Do I Listen to Bill? Why do I listen to Bill? The other day he asked what I wanted to do - then continued "I thought maybe we'd..." (so why did he ask me????) 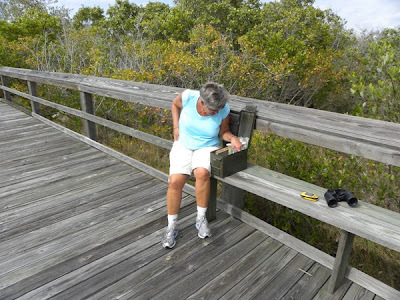 "try to find that geocache at Estero Bay Preserve." We had gone one other day, but the mud and water (and the fact that Bill had printed out the wrong directions) kept us from finding it. 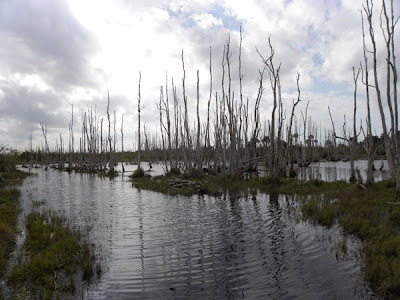 The dead trees in the background are Melaleuca - an aggressive invader that spreads rapidly, destroying habitats by converting beautiful sawgrass marshes, wet prairies, and aquatic sloughs into impenetrable paperbark thickets. 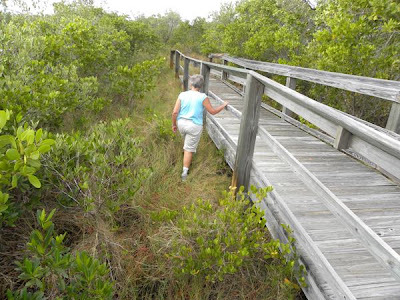 It was introduced to Southern Florida from Australia in the early 1900's to help dry out the swamps so they could be developed and is now a huge ecological threat - especially in the Everglades. Here's the really awful part: One Melaleuca tree can store an estimated 20-million seeds. They are released when the trees are stressed, so many of the methods used to try and kill the trees may actually cause them to spread. There were a couple of Plovers on high ground. At first I thought they were Killdeer - but they were much too small. 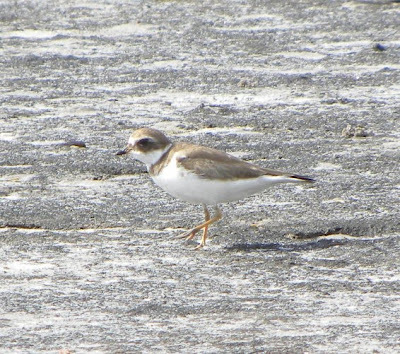 I sent the picture to my sister as she is much better with the shore bird identification than I am and she says it is a Semipalmated Plover. Thanks Beth! That's me at ground zero looking for the cache. The boardwalk was around 15 feet from a huge tidal pond - and we were there at high tide - so guess what I was walking in - up to my ankles. Bill finally spotted it through the deck slats. At least the water washed some of the mud off my shoes. We went back on a different trail. Yes, it was plenty muddy - and slippery - but there was not near as much water so at least I knew what I was stepping on. Have I mentioned the smell? 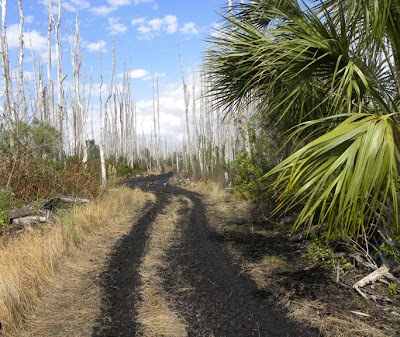 Black mud stinks! 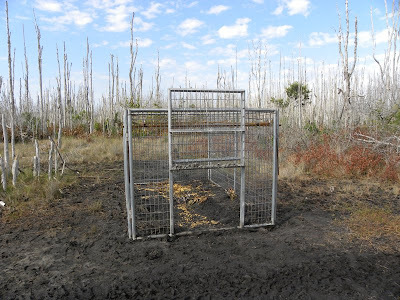 This is a hog trap. The feral hogs are another big problem in the preserves as they dig up huge areas looking for food. I tried to get Bill to pose for a picture inside the trap - but at this point he was afraid I'd leave him there (and I just might have!). 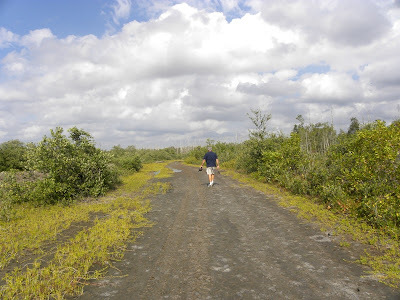 We arrived back at the car hot, thirsty, dirty & smelly - but glad to have finally found the illusive Estero Bay Cache. This cache was special to us because we met a geocacher last year at ground zero. He was looking for the cache around the deck where we were sitting looking at the birds around the pond. At that point we were not into geocaching - and meeting and talking to him was one of the factors that got us started. Outside the preserve, these beautiful Wood Storks and Great Egrets were waiting for us. A nice way to end our walk. So to answer my question "Why do I listen to Bill?" - I listen, because I love him and we have amazing adventures every day. I am so-o-o lucky!